The Dekeyser’s Nectar Bat is endemic to Brazil. It is considered to be a vulnerable species. The Dekeyser’s Nectar Bat inhabits caves in dry forests. It has been noted that they remain in the same cave for periods of up to one year. These nocturnal animals emerge from their cave dwellings soon after dusk, and return to their cave just before dawn during the rainy season. 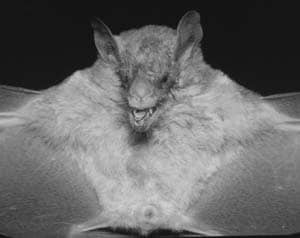 The bat feeds on insects, seeds, pollen, nectar and other such food sources.